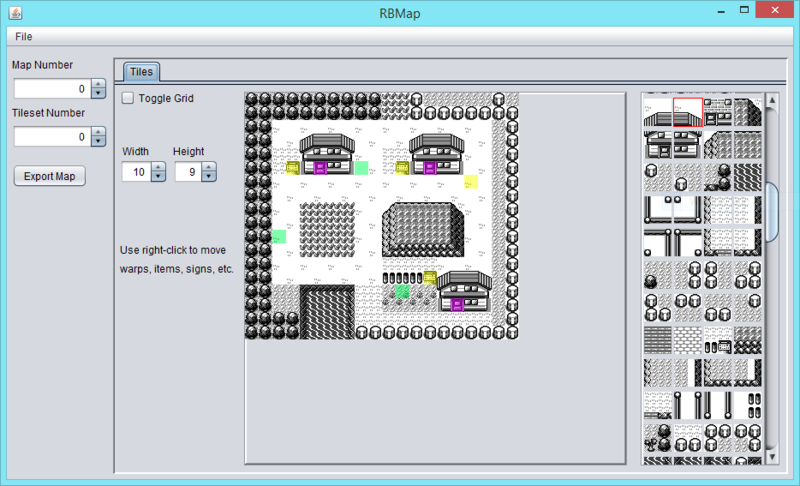 This is a cross-platform map editor for Pokemon Red & Blue Versions (Maybe Yellow Version, too. I haven't tested it.). 1. Click File -> Load ROM. Search for the Pokemon ROM you're working with. Click "Open". 2. After a second or two, the map and tile panes should be filled in. If they didn't load correctly, see the Config section below. 3. Click on a tile in the far-right pane and then paint that tile onto the map pane. It's pretty self-explanatory. 4. When you want to save a map, click "Export Map". This will allow you to save the map data to a file. Then, you can use that file to copy/paste its data into the ROM. If you're working with the assembly, just save that map into the maps folder in the disassembly project. You can change width/height of maps, too. For this map editor to work, it needs to know a couple addresses in the ROM to be able to load the maps and tilesets. You can change these addresses in a file called "config.json" in the Config folder. If you're working with the disassembly project, then it's very possible that the addresses for MapHeaderPointers, MapHeaderBanks, and Tilesets have changed. You can find their current addresses in the ROM by looking in the pokered.sym file. The 4 color settings are if you prefer different colors to be used in the maps and tiles. They're set to different shades of gray by default. Sweet, downloading this now. I'm sure it'll come in super handy for Red++/Pokemon Forever. Thanks! Thanks a lot, ShantyTown. I'll try using this from now on and let you know if I have any further thoughts, but should do the trick! This is the best tool I have used so far. With the ability to export a map in raw binary and to change the height and width you could easily use this tool to create a completely new region from scratch. Doesn't surprise me because of the gen 2 graphics patch. If you've changed the way it loads tiles and stuff, that might break it. Although, maybe you just haven't updated config.json to the correct values? I didn't even have to update config.json. Are you sure no other addresses are hard-coded in your program? Hmm... I just double-checked the source code, and nothing else is hard-coded besides those 3 things. Wait, that's weird. It doesn't open maps that have been edited, but it does open maps that haven't been edited? I have no idea why that might be. The program should handle repointing fine (it's been working for Maize obviously). I'll keep thinking about it, though. You could always clone my repo for testing. I've uploaded a slightly-improved version of RBMap. It can now support extended blocksets, and the (x, y) coordinates are now correct. All black on ubuntu (works fine on win). Hey. This is an excuse for me to finally set up a Linux partition! I know what I'm doing tonight. Any advice on setting it up? Would you recommend Virtual Box? I set up a Linux mint VM, and it works fine for me. I figured out how to properly display images in a .jar, so now RBMap shows you the locations of warps, NPCs, items, and signs on the map. You can right-click and drag to move those around, too. It's useful for designing where trainer and items are going in your maps. You can't save their locations to a file or anything like that, though. Moving the events changes nothing when exported. Also, border block modification? Really useful in terms of a graphical way to edit the maps and drop them straight into the dissassembley, but these features are kinda...a given? I suppose it would require modifying multiple files in the dissassembley project.. I'm not sure what you mean by "these features are a given". I assume he means that it is pretty much assumed that a map editor will let you edit the event positions too, since they always have in the past, including Pokemap from back in the day. Ah, I bet you're right. Pokeglitch is working on a map editor that will do all of these things. It sounds like he's almost ready to release it, too. Then that tool will be the go-to map editor for the disassembly. No disrespect, this is really simple to use and I like the fact you can export it to a raw format. Just was confused that you added right functionality to events but it doesn't really do much except give you "an idea" of where you'd want to put your events. Maybe change the "hover over tile" grid format to 1 x 1 so you can easily copy coords into mapObjects? Hi I am new here, looking for exactly a program like this. I downloaded. Extracted everything, but I still cannot get maps to load. I am running Windows 8.1. If you think that could make a difference. The config file is setup correctly. Does the program run, at least? What happens when you choose the Red Version ROM? Are the map and tile windows pure white? I run Windows 8.1 myself, so I know it works.